Welcome to Handmade Originals by April Cummins. They are not mass produced. Mr Claus is dressed in an Antique quilt. His pants are heavy Olde Blue fabric. He holds a primitive bear. His pocket on his jacket is full of vintage look toys. He has a letter bag over at his side. He stands on a base. I hand sculpt and hand paint each santa face, fingers and boots One at a Time. His beard is real lambs wool. His arms are wired to pose. He stands aprox 18 inches. This Santa will make a wonderful addition to any Primitive Country Santa Collection this Holiday Season. 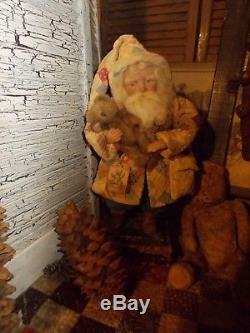 The item "Primitive Santa Claus, Vintage Quilt, Boyds bear, Handmade One of a Kind" is in sale since Sunday, July 22, 2018.